Quantenna is talking about the details of their 8×8 802.11ac MU-MIMO radios, something SemiAccurate likes to hear. If you were wondering how they can call the parts ’10Gbps’, we can finally explain it as well. SemiAccurate has previously brought you the news about the Quantenna 8×8 announcement and demo at CES, they were long on promise but short on specs. That said there were more than enough details to see they weren’t slinging bull to unquestioning journalists. Until today we couldn’t tell you exactly what was going on but we can now say that the claims are real. First off Quantenna is launching a bunch of new chips, a full family. The baseband and processor come in three flavors to two RFICs are added, 2.4GHz and 5GHz. Those don’t change with the baseband model, they are common to all variants. The CPU/Baseband devices are built on TSMC’s 28nm process in case you are wondering and the block diagram looks like this. The first question at hand is how does the company make the 10Gbps router claim. 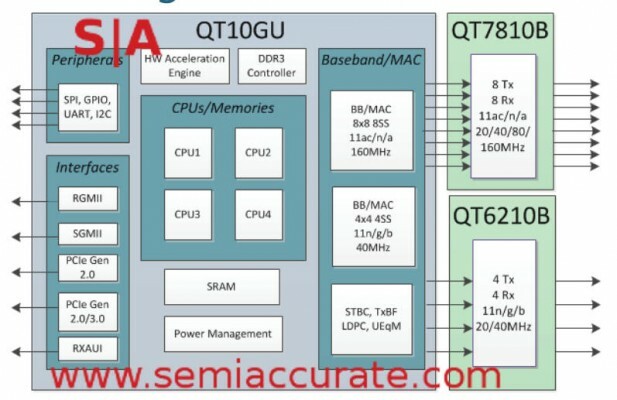 The short version is that the QSR10GU, the highest end part, has 8×8 802.11ac MU-MIMO radios as well as 4×4 802.11n radios. Eight full 160MHz channels can push 1066Mbps each for a total of 8528Mbps plus about another 1066Mbps from the four 802.11n radios. That adds up to a bit under 9600Mbps which you can fairly round to 10Gbps. Since the radios can actually push that bandwidth, the chip can be fed by 2x PCIe3 lanes for 16Gbps bi-directional I/O, we will say they meet the marketing claims. The full I/O option set is in the diagram below. Moving down the family tree there are three more options. The QSR10GA has 8×8 + 2×2 radios, QSR10PA is a 6×6 + 2×2 part, and the odd one out is the QSR10U5 which only has 8×8 5GHz radios. Anything less than that would probably be better served by the older 4×4 802.11ac radios. What impressed us most is not the scope of the offerings but that a single SoC has the DSP power to do all of that in 8×8 MU-MIMO mode, the compute necessary is pretty intense. With that out-of-the-way we come to some of the more marketing oriented claims from this launch, starting with 8×8 being better than two 4×4 radios. There are several aspects to these claims starting out with the infrastructure side. One 8×8 radio takes less energy to run than two 4x4s and Quantenna says it is more effective in reception too. The energy use side is pretty obvious, 2x 1000mW radios uses less than 1x 1000mW radio, but is it better? Quantenna claims it is because eight radios and eight antennas are able to pick up low quality signals better than four. Two 4×4 radios may have the same throughput but they have to operate on different channels and use more precious spectrum while doing so. For a home user this probably doesn’t matter, for an office or stadium, it is the only thing that matters. In short antenna diversity gives you more chances at the same inbound signal. Related to this is that two 4×4 radios on adjacent channels need a whole bunch of filters and hardware to avoid adjacent channel interference (ACI). A single 8×8 radio can be cheaper to build than two 4x4s but that likely pales against the cost of the RF engineers designing around ACI. Without that problem you can make much better use of the available spectrum or potentially put another 8×8 radio in that adjacent channel and get double the bandwidth for your ACI pain. The last bit is far less technical, Quantenna is using the term “Wave 3” for their new radios. You might recall 802.11ac Wave 2/Release 2 adds a bunch of features, most of which are optional. Quantenna is defining Wave 3 as an 802.11ac device with all the features turned on, everything optional implemented, plus a bit of their own secret sauce. To be clear the Wave 3 term is not a standards body thing, it is their own label but it does make sense.